See what's available and order your gear here but mail order is not available, we are not Amazon you know! Please also complete this LCC merchandise order form which can be found below. All payments must be made upfront. Coolmax breathable nylon. Breathable side panels. White with green panels and yellow piping. Adult sizes: M (44"), L (46"), XL (48"). Children's sizes for 6-8 & 8-10 years old. Coolmax breathable nylon. Breathable side panels. Pink & Navy Blue panels and stuff. Breathable nylon. White with green pocket panels and yellow piping. Elasticated waist & yellow tie cord. Adult sizes: XS (30"), S (32"), M (34"), L (36"), XL (38"). Woollen dark green cap with Lamma C.C. logo embroidered on front. Elasticated back. Green nylon mesh cap with Lamma C.C. logo screen printed on front. Brushed cotton yellow cap with dark green peak. Lamma C.C. logo embroidered on front. Adjustable strap with brass buckle. White cotton wide-brimmed hat with sewn in towelling headband. 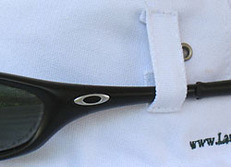 Loops to hold sunglasses. Lamma C.C. logo embroidered on front. Coolmax breathable nylon. White with green and yellow bands. Breathable side panels. Adult sizes: M (44"), L (46"), XL (48"). Nylon. Green with white panels and yellow bands. Sewn in undergarment. Two pockets. Perfect for beating your wife in. White polo with green & yellow edging & placket. Green polo with yellow panelling & grey piping. Yellow placket. Holds a can of beer or stubby superbly; also rumoured to hold soft drink cans. The neoprene keeps your drink cold and fingers warm. Folds flat when not in use. Screen printed logos.